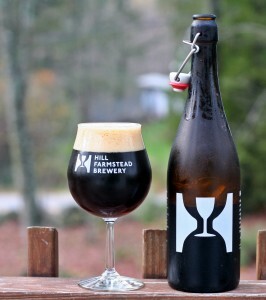 This is an interesting beer from Hill Farmstead and entirely different from the other beers I have reviewed. Almost all of those were hop forward; pale ales, IPAs and Double IPAs so a smoked beer with little to no hop presence. Appearance is a deep brown with hints of red. Aroma has lots of smokey malts and a bit of coffee. Taste is very complex with a fair amount of smoke but far from overpowering. There is also some sweetness with just a hint of a hop bite. The beer is smooth, lightly carbonated and very easy to drink. ABV says 7% but it seemed to hit a little harder than that. Brewers Description: Brewed in collaboration with our great friend and former colleague, Anders Kissmeyer. Anders personally smoked the malts over Beech wood. A robust, malty smoked brown ale. 7% abv.